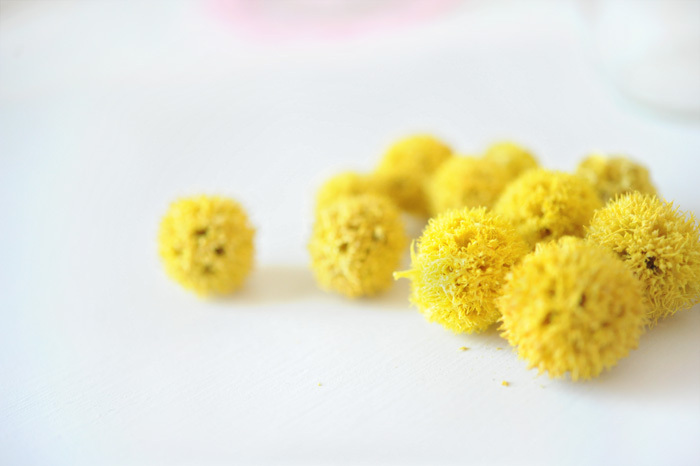 I've always loved dried billy button flowers, they look so whimsical and modern, but I never seem to find them in stores. I've heard you can get them online somewhere, but honestly if it's not at my local craft store or on Amazon, I usually don't get around to it. 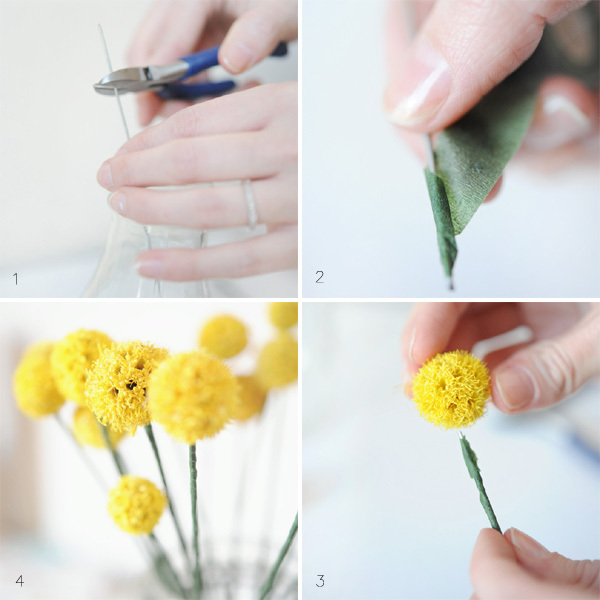 Start with dried flower balls, wire sticks, and floral tape. 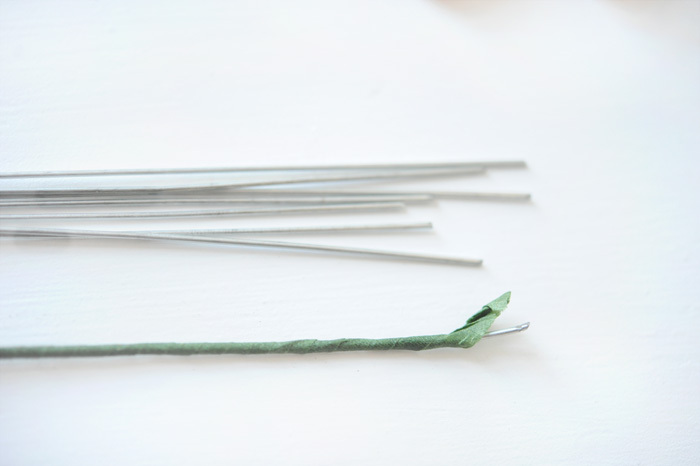 Then assemble: 1. set wire in jar and cut to desired height, 2. wrap wire in floral tape (dark green is what I had on hand, but other colors would look nice), 3. poke the wire into flower ball (adding glue if you'd like). 4. Keep assembling until you have a pretty arrangement! Once you start making these it's kind of addictive - instant flower arrangements that never die. Awesome. bright, colourful and never die? LOVE it. Simply adorable - thanks for sharing such a great idea! Such a simple and brilliant idea:) Thanks for sharing. I love the burst of yellow for a home. Oh wow, these are really nice! It would defiantely be nice to have some flowers that require no maintenance. I'm terrible at taking care of flowers. brilliant! Now I only need to find them here! These cute button flowers will brighten up an room. Thanks for sharing! So cute! Love this idea. one of my girlfriends used these flowers as her wedding bouquet :) they were just perfect. Those are adorable! I don't know if I have ever seen them before! oh how i love your blog! Since I love Billy Buttons it's only natural that I'm a fan of this post. These are just stunning! Thank you so much for the tutorial! Adorable! Sometimes, it ends up better that the easy way and you proved that! Great DIY. I love it! precious! yellow is just so happy! i love to have a little bit of yellow in every room! this is such a great little project! Where did you find the dried flower balls at? I am also really interested as to were you found these flower balls? I would love to use these for my wedding! What store were they in? Anonymous, so sorry for the late response.. I got my dried bur at Joann's, it's labeled as Natural Filler and made by Panacea. In the aisle with other vase fillers like pebbles, rocks, etc. (they come in yellow, red, and green). I hope this helps, feel free to email me if you have any questions! (hooraydesign at gmail). cute, found you from papernstitch. love those cute button flowers. i'll be following. Best blogs huh… thanks to compile these; it actually helps me a lot.